Ok I have a confession - I am a beauty blogger, enthralled by all things skincare, makeup, etc, but I was never quite clear on Retinol, which is a pure form of Vitamin A. What it was, what it did, why I should use it. The truth is while I care very much about maintaining clear skin, I typically saw Retinol as a product that was designed for treating intense anti-aging concerns. While I definitely want to keep myself looking as young as possible for as long as possible, I tend to gravitate towards products that help me deal with my adult acne and keep my skin hydrated as I find hydrated skin is beautiful skin. 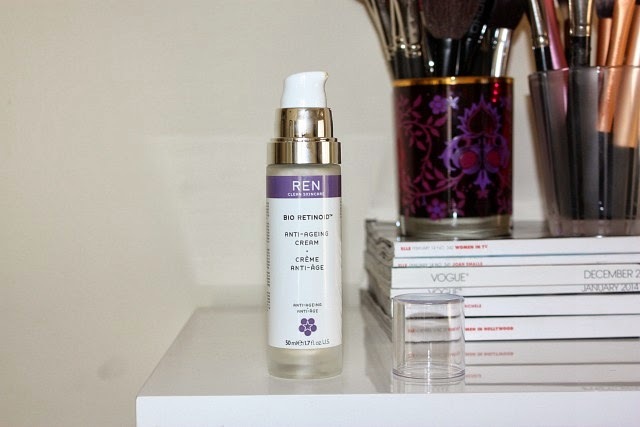 Then Ren sent me this Bio-Retinoid Anti-Aging Cream to try and there it was - Retinol staring me directly in the face, coaxing me to try it. And since I am a HUGE fan of the Ren brand, I had to give it a real go. Before I did however, I wanted to understand a bit more about this magical ingredient. So I did some research and was pleasantly surprised to see that in fact it does a lot more than simply help address anti-aging concerns. It is also designed to help unclog pores through exfoliation of dead skin cells, thus leading to fewer breakouts and clearer skin! Ding! Ding! Ding! So I dove right in, face first. I was aware that Retinol can cause some dryness/irritation/flaking in certain people so I added to my routine twice a week at first. And after 2 weeks, I had no issues so I increased to 3-4/x a week and I have to say, I have been so impressed by the results. My first observation was the even toned skin and secondly was the fewer breakouts - holy moly! So because I am a doubting cynic, I did a test and took myself off it for a 2 week period and I did in fact notice a slight increase in blemishes - cue the shock and awe. Some other noteworthy benefits of Retinol are it's ability to boost collagen which reduces the appearance of fine lines and to stimulate cell turnover which helps even out discoloration and smooth skin. Frankly, I saw it all - and my skin has continuously looked better and better. Now there is that myth that using Retinol can make you more sun sensitive but after some research, I have found that is not the case. The actual ingredient is sensitive to sun so it should be applied at night but the effects on your skin's sun sensitivity is no different than if you used a basic scrub. This has been my first prolonged experience with Retinol and I have to say, I am hooked - with this particular cream inching its way up my cannot-live-without list. What has been your experience with Retinol? Good to know. Thanks for sharing! I love REN as well. I love using retinol! It was actually one of my first "upgrades" in my skin care routine. I use Roc's night time treatment and it's been amazing.